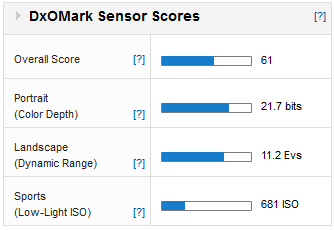 A DxOMark Score of 61 ranks the 700D 119th for all sensor scores and it’s clear from the outset these scores aren’t impressive. In fact they’re towards the bottom for APS-C DSLRs released in the last 5 years, only outclassing older options like the Nikon D40 (2006). Against recent competition, such as the $879 Nikon D5200 with a DxOMark Score of 84, or the great value $598 Sony SLT Alpha 58 with a DxOMark Score of 74, the Canon is looking like the gooseberry at the party. Things don’t improve much in the Portrait and Landscape scores either, which, with 21.7 bits and 11.2 Evs respectively, both rank 125th overall. 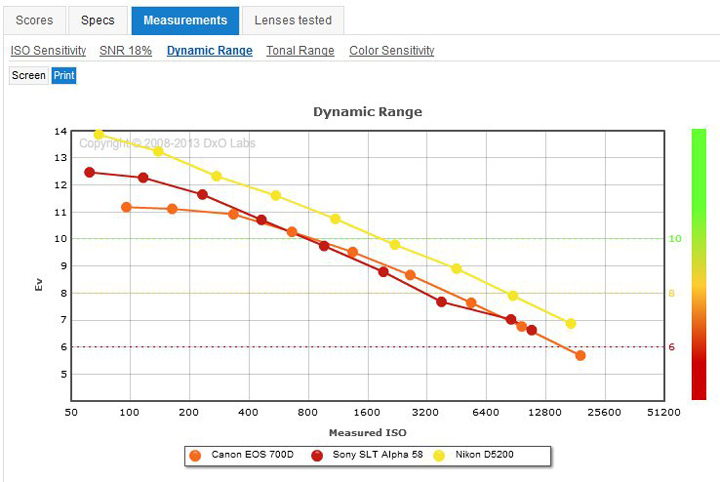 The EOS 700D’s Low-light ISO score of 681 ISO is its best aspect, placing it 90th for APS-C sensors. We can say the 700D has the same image quality as its predecessor. 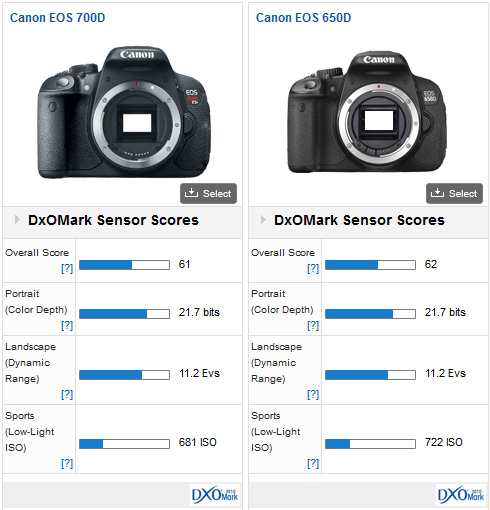 Portrait and Landscape scores are identical, and there’s a minor drop off for Sports, which just gives the EOS 650D the edge overall, scoring 62 points compared to 61. There’s no difference between the two models in real world terms therefore, and our measurement shows they effectively have same sensor. 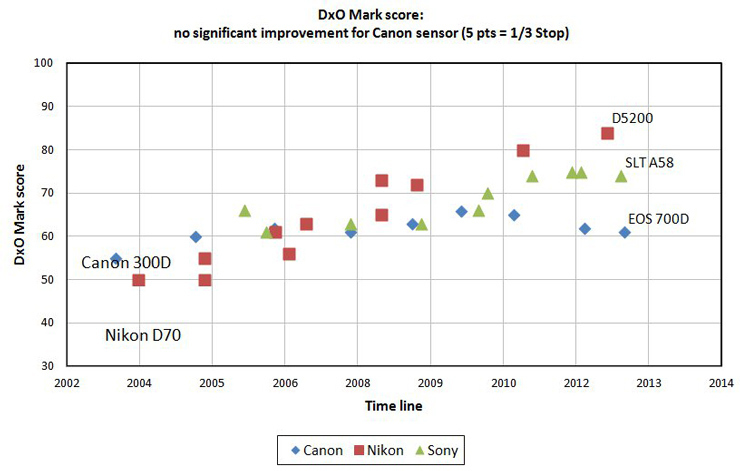 This lack of improvement in Canon sensor scores is highlighted when looking back at the evolution of DxOMark sensor scores for Canon, Nikon and Sony entry-level DSLRs. 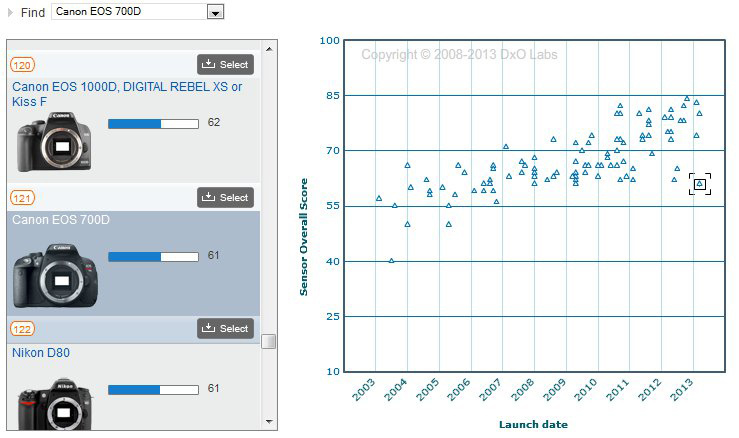 Whilst a clear upward trend is evident for most new models from Nikon & Sony, Canon shows no significant improvement from the Canon 300D launched back in 2003 to this latest model. Pitted head to head against some of the latest entry-level competition therefore, the EOS 700D is somewhat off the pace. With a DxOMark score of 74 the $598 Sony Alpha 58 offers nearly a +1 Stop improvement in overall image quality, while the $879 Nikon D5200 is +1.6 Stops better overall with 84 points, a whopping 23 points more than the EOS 700D. The starkest difference between the EOS 700D and D5200 is the Landscape Score, where at base ISO the Nikon model offers a +2.6 Stops improvement for Dynamic Range. Results for the D5200 do drop off more steeply compared to the 700D however, so by ISO 800 the Nikon’s advantage is down to +1.5 Stops, but the D5200 does offer better dynamic range at all ISO sensitivities. The same trend doesn’t occur with the Portrait scores however, where the Nikon D5200 offers around +1.5 Stops better Color Depth consistently through the ISO range compared to the EOS 700D. The Sony Alpha 58 sits roughly in the middle and for Dynamic Range offers a +1.3 Stop advantage over the EOS 700D at base ISO, but from ISO 800 onwards they’re effectively the same. 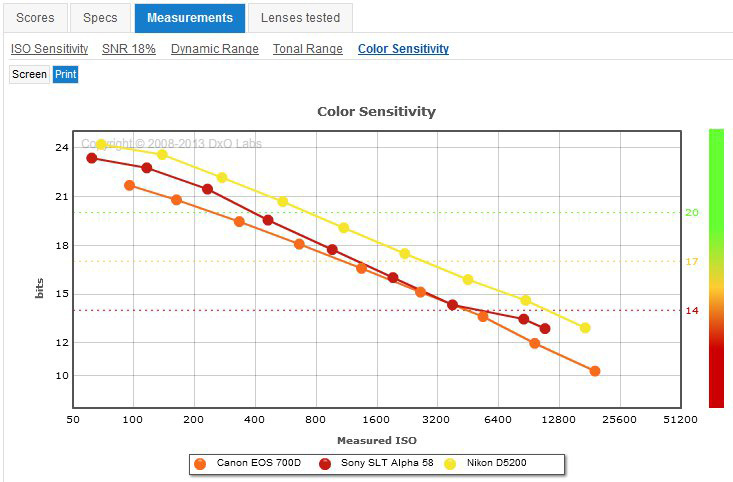 For Color Depth the Sony DSLR starts ahead of the Canon with 23.3 bits vs. 21.7 bits, an improvement of +1.6 Stops, but the gap narrows as sensitivity is increased and by ISO 3200 the Canon and Sony have the same Color Sensitivity. For Low-Light ISO the EOS 700D and Alpha 58 are similar, scoring 681 ISO against 753 ISO respectively, but the D5200 takes the spoils again, offering +1 Stop better Low-Light performance with a score of 1284 ISO. 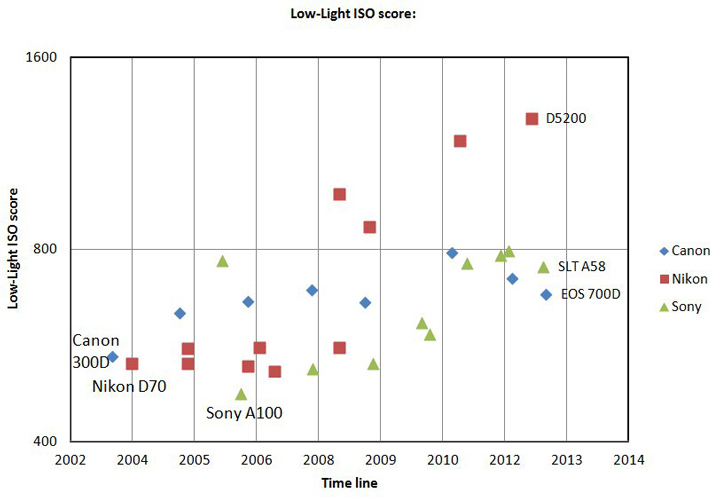 Looking at the progression of ISO performance for entry-level DSLR releases, Nikon’s development over 10 years has seen a +0.5 Stop improvement in Low-Light and Sony have also made strides forward despite the switch to SLT technology, but Canon APS-C sensors haven’t developed to the same extent. The 700D isn’t a significant improvement over its predecessor the 650D and with almost identical specifications and sensor scores they are effectively the same camera. 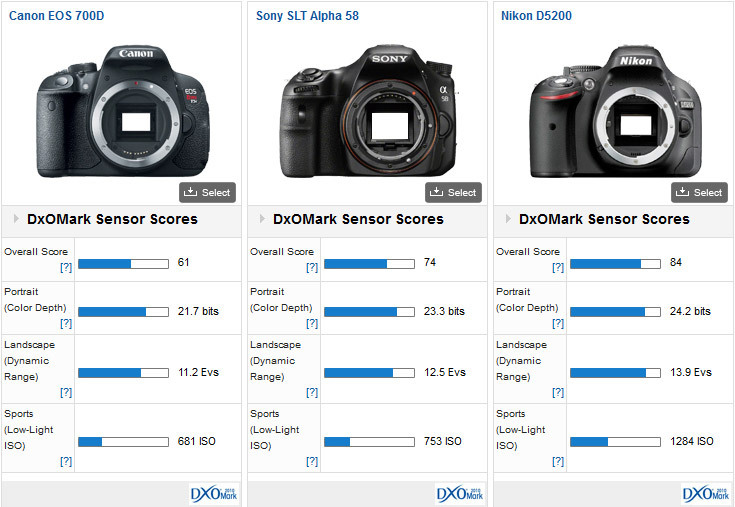 Our Sensor Score analysis of APS-C DSLRs shows that while Nikon and Sony are making steady improvements the same can’t be said for Canon with none of their APS-C sensors breaking through the 70 points barrier. 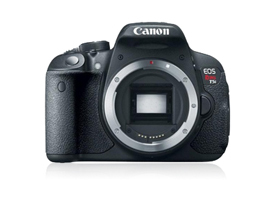 That said if you’ve invested in the EOS system but are after up to date entry-level Canon DSLR then now’s the time for a good deal on the 650D.